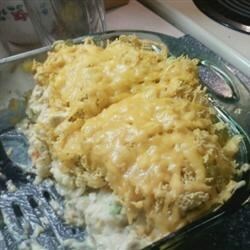 "Chicken Casserole with rice and veggies - easy to prepare. Great to use with leftover chicken. My family says it has a flavor similar to chicken pot pie." In a large bowl combine the soup, chicken, cooked vegetables, cooked rice and water. Mix well and spread mixture in a 9x13 inch baking dish. Sprinkle crushed cracker crumbs on top and bake in the preheated oven for about 15 to 20 minutes. Let cool 10 minutes and serve. I can't believe this recipe has a 4.5 star rating--it was so bland. Luckily, I had all the ingredients on hand so I dont' feel like I wasted too much time or money! This was a great recipe to use my leftover chicken and rice! I used cream of mushroom. The crackers were a great topping. Yum! My whole family liked this casserole. I made it with turkey leftovers instead of chicken and it was great.